The number of bloggers worldwide has increased tremendously. Many of us would have more than 1 blog. If yes this widget may help you a lot to share the traffic in both the blogs. Even if you don't have more than one blog you may add this widget to your very own blog. This will help your blog have less bounce rate and more pageviews. Automated Recent Posts Slider is a widget for blogger which will show the recent posts of your desired blog with nice and awesome interface. This widget updates automatically and you do not have to edit the widget and add images, titles and description again and again. You just have to add the URL of the blog and your setup will be complete. A live demo of this widget can be seen below. After adding the code change the URL in Bold Blue with your own desired URL and save the widget. Finally save the template which will make the widget live. You are done now. 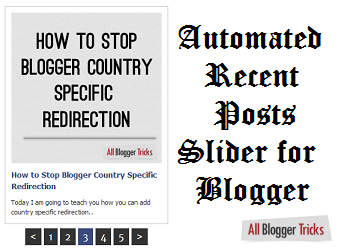 Now you and your visitors can see this awesome Automated Recent Posts Slider in your blogger blog. Wow.. This is amazing! How do I change the size of the window to fit into the side panel? how to change the size of this widget? hassan brother i need help i want this type of slider that can automatically update plus doesnot show those posts that are currently on the slider. Means http://fng-test-blog.blogspot.com/ visit this you will see theat the first post is also the first slide of it, i dont want it to show as a regualr post as far as it is on the slider. and the thing i want is like this site http://www.thisisanfield.com/. please help me. or else please tell me how to resize it? Hi! how can i use the widget for specific labels? the script does not include the feed but only the url. Can we modify it for specific tags? hey! a little help here.The slide rotator is appearing two times, how i can fix it? On the homepage the slide rotator is appering two times. Awesome Slider . I inserted it on my blog http://www.change24h.net. That was exactly what I was looking for. Thank you. Thank you very much, I love your tutorials. Hello, how can I enlarge the size of the slider? can we use random posts instead of Recent Posts? Its not working any more! I guess blogger blocked it! it worked for few days now I cant see the photos. Help please! This could be possible because you may be dragging the images/using images hosted on non-blogger servers. Blogger crawls only those images which are hosted on its server with the exception of a few selected. Is there anyway to change it from recent posts to instead showing a blogs popular posts? How to change width size? I want it to be 100% to fit in my template, could it be possible? how can i change the witdh, please? I am alive.. :P Actually the problem is I am in grade 11 now and I have absolutely very less time to manage but I assure I will keep this blog alive.. ;) My hand has been fractured, so I am delaying a post which is almost 90% complete. Can't type much. Muchas gracias, funciona de maravilla. Saludos. (first, sorry my English) I tried it, but the slide rotator was two times on the Blog. I tried it a second time. The same thing. Every time I delet the Widget, there are still empty widgets in the layout modus. I can't delet them. Obrigado, postagem muito boa, bem proveitosa. I tried them to my blogs http://igngamesdownloads.blogspot.com and http://bigbadplanet.blogspot.com and they worked. I just cant find a way to change the width and height. Thanks. Really nice!, can you explain me, step-by-step, how i can change the size? It would have been nice if there was more customization though. Hi, I tried this widget but it stuck to the first slide it never changes? This is great template blog.....nice information and useful. Hi, I was using this slider for a couple of months and now suddenly started to not show the images of my latests posts, all images are uploaded via Blogger. Any idea what can I do to fix this? Really Nice!! thanks for your information. How to chane size and remove controls? I want it to use on my header, Please help. Very nice post your coding is good working on my blog site Best Shopping Sites! Really working in my site. thanks for share. how to make container fluid? It work on me. However after you open the page you still need to refresh it so that it will work. Please help me on this so that my viewers will no longer refresh and automatically loads and shows up all latest post. Can i see, How is this Looking?